Whatever one’s attitude and style, reality can always be a problem. If one tries to write for a blog based on analysis, logic and statistics, there is always the chance that there simply aren’t any new analyses one can do in order to bring light on a situation. If one tries to focus on sensationalism and outdoing each over-the-top piece with another even more over the top, ultimately the top becomes so high it loses all contact with reality, and becomes a parody of itself. This seems to be where the Daily Mirror has got to: over the top and far away. Having set up its own set of bloggettas which operate as a way of reusing each spot of “news” that comes along, half a dozen times or more, and now being part of a newspaper group that includes the ever more ludicrous Express group, they find themselves trapped in a spiral of the increasingly bizarre. A sort of football equivalent in the Mirror of the Express reporting the “Mystery of 24 alien black-boxes discovered near Egypt’s Pyramids of Giza” last month. Livio Wenger is a competitor in the Olympics and not a relation of the Arsenal manager. Exciting stuff isn’t it? But the problem remains: how does one go further when one is already way beyond all the bounds of reason, and come to that, entertainment? Well Football London shows us with the headline “Three ways Arsenal could start vs Ostersunds in the Europa League without Aubameyang and Ramsey… We take a look at the options available to Arsene Wenger in the Europa League. 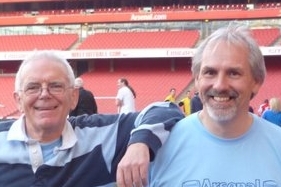 The piece is by Charles Watts, whose profile describes him as a lifelong fan and season ticket holder at Arsenal and he published a piece just before midnight on 13 February (which is to say very late last night) on Football London (which is also to say, quite a long while after the news of Lacazette’s knee operation broke) with the portentous lead line, “So how could Arsenal line up in Sweden without Aubameyang and Ramsey? We take a look at the options.” (Notice how bloggettas love to refer to themselves in the plural – normally a strong sign of megalomania). Ah well… events. They creep up on you, when you are not looking – and of course such things happen at Untold too, on occasion, but that still didn’t stop us having a little giggle. Anyway, we now have three injury issues: Lacazette and Santi are both most certainly out, Ramsey might or might not be, no one seems sure. And Aubameyang is cup tied. But there is one interesting and more serious idea circulating which is of playing Ozil as the “false number 9” with Ramsey (assuming he’s fit) and Welbeck buzzing around him and filling in when Mesut drops deep back to feed passes to them. Jack is then free to play in his role a little further back. Mr Wenger has said he will play the first team, which of course makes sense given the paucity of league games at the moment, but that still raises a question as to whether Cech should replace Ospina in goal. It’s hard to call. Less difficult to deal with is the notion that “Arsenal, unlike the other top clubs in England, do not have much depth in their squad,” which one of the bloggettas came up with – the evidence of which seems to be listing the first team and generally saying of each one, “has been performing poorly of late”. If evidence is ever needed, consider Elneny who was both heavily criticised and the player of the month in January. Strange to be both at the same time. Anyway, by and large the selection is fairly obvious: we have Danny Welbeck to drop into the team and still have the tantalising prospect of seeing Wilshere and Ramsey playing together in the side although probably not next to each other as a midfield duo. Östersund away: the squad and the weather forecast: it might be worth wrapping up. Man of the month. Happy to sit and maraud the land of the dead. Ahead of Xhaka , who I think wants to play Jacks role. Well, only one winner there. It’s only strange if you put it this way, without any context and, indeed, all facts. Firstly, Arsenal didn’t really enjoy January. We played four league games, won one, drew one and lost two while averaging two conceded goals per game. Secondly, Arsenal were knocked out of FA Cup in 3rd Round for the first time in Arsene’s era. We were beaten 4:2 by Nottingham Forest (not the one of Brian Clough, mind you) and Elneny played for 90 minutes. Finally, there one bright spot in January – we have reached Carabao Cup Final in two games v Chelsea (0:0, 2:1). Overall, we played seven games in January: won two (both at home), lost three including one to the Championship club and drew two. We have conceded 13 goals or almost two per game. Elneny is a defensive midfielder/third central defender. All-in-all, Elneny being the player of the month voted by Arsenal fans online is not a special feat given how we have performed for quite a while, especially away from home. Sometimes a club scores just one goal in the whole month and their fans have to vote that goal for the goal of the month (I think Aston Villa even had a case without scoring goals through whole month). That doesn’t mean their form is not poor. I’d be surprised if Mr Elneny has his player of january award on the mantelpiece. But however poor the opposition, you’ve still got to beat them. The Cup game was a travesty ,particularly for Mo I felt. Without a class ,senior playmaker in the team ,or senior players prepared to take opponents on, i.e. Jack, and …..mmmmm , Mo was gifted the task. Not his area of expertise ,sadly. I suspect most people ( I wonder how many actually voted, the percentages indicate at least 50 !) ,voted on the back of the Chelsea win , as recognition of a job well done. Thought he was solid on Saturday too. We need to do a job on Thursday too. You have got very grumpy of late, seeing the negative in everything. Why is that? I used to enjoy your many insights. Maybe our away form has just got to you! I take that back! I just read your comment about Spurs on the other article. I know we no longer have Giroud who can reasonably be depended on to score a goal or two for us against Ostersunds tomorow night. And also we’ve lost Debuchy also of Arsenal II tea. But Welbeck who is of Arsenal II team too and widely expected will step in into the striker’s position to lead the line for Arsenal in this ELC match is not as dependable as Giroud who we can count on him to give us one or two away goals in this kind of match. Even if Welbeck is 100% physically fit and at the top of his form, yet, his is not a striker Arsenal can trust to score. For, he’s a misser who profligate a lot in front of goal for Arsenal since he has joined the club. Let’s hope if Le Boss does start him ahead of Nketiah, he’ll not let us down in this match but score or assist others to score for Arsenal. If it hasn’t come to for security reason, Le Boss has to start most of his first team starting XI in these 2 legged ELC round of 32 games against Ostersunds, I’ll prefer to see Le Boss rest the majority of his first team starters for the Man City Carabao Cup final match at Wembely and in the PL too at the Ems. It’s on this premise that I am basing my starts on Arsenal II team but Wolshere of team I to start this match and give us a win over Ostersunds. My 3-2-4-1 Arsenal starts and 7 on the bench Gunners for Ostersunds. Macey Osei-Tutu Mavropanos Dragomir Willock Xhaka Nketiah. i think Wenger should go for Arsensl Reserves And not the first team in Sweden. I think Arsene has been doing a magnificent job when it comes to rotation this season in both Carabao Cup and Europa League. He has thrown Arsenal II for the group stage which could turn out to be invaluable experience for players like Nelson, Nketiah, Willock and Maitland-Niles while also introducing Jack back to the first team but now it’s time for the big boys to keep us on the track for both a European trophy and a Champions League place. Now, I haven’t checked the weather forecast but I reckon we should be able to deal with the Swedish side – with all due respect – with our almost Best XI. Whether Arsene will go with 3-4-2-1, 4-2-3-1 or 4-3-3 – I don’t know. Ospina-Chambers, Mertesacker, Holding-Bellerin, Elneny, Xhaka, Kolašinac-Mkhitaryan, Özil-Welbeck/Nketiah. Ospina-Bellerin, Koscielny, Mustafi, Monreal-Elneny, Wilshere-Mkhitaryan, Özil, Iwobi-Welbeck/Nketiah. Ospina-Bellerin, Koscielny, Mustafi, Monreal-Elneny-Xhaka, Wilshere-Özil, Welbeck/Nketiah/Iwobi, Mkhitaryan. I reckon I sound grumpy because there is an odd feeling that Arsenal have been doing things exactly how I would like them to do and still our results in the league don’t show it. 1.I had advocated keeping Alexis and Mesut at all costs while adding top quality players like Lacazette and Kolašinac (I had had my doubts about Lacazette but it turned out he is a better player and a worse scorer than I thought he’d be) hoping that our streak of great results would keep both of them at Arsenal. 2.When opportunity to sign two top players to replace Alexis turned up, I was all for signing them. We got a 35 million pound player for a player which contract would have expired in June. We got one of the deadliest strikers on planet for 56 million pounds which is peanuts in today’s market where signing spoiled brats like Dembele, Mbappe and Neymar takes nine-figure fees. 3.Selling Coquelin, Ox, Theo and Giroud for the money we got is exactly what I would have done even if I think both Coquelin and Giroud are players that have special qualities other Arsenal players don’t have. We did basically everything right. And yet, given how many points we have been robbed by PGMO (Stoke, Watford, WBA), with Arsene accepting the charges instead of challenging them and with notorious silence from the upper levels of our club. We have also spent money – a lot more money than, say, Tottenham – to line-up one of the most formidable quartets in the European football but something is still missing. A Cazorla. A Fabregas. An Arteta. A central midfielder/brain who will coordinate this formidable outstanding quartet. Jack – let’s be fair & honest – has never been the brain (and it goes beyond the pitch as well). He can be the heart though. Also, defensive sloppiness from the first day of the season is something extremely annoying and discouraging. Whenever I see three of our players chasing the guy with the ball on the left side of our defence while the opponent makes the run through the middle (and I saw that in THREE games since the turn of the year), I wonder what and when went wrong. It’s no longer a patchy defence of Squillaci, Silvestre and other rejects that nobody else would have signed but a cash-strapped Arsenal. It’s Arsenal of experienced international defenders Koscielny, Mustafi, Monreal, young talented lions Chambers and Holding, excellent full-backs and wing-backs Bellerin and Kolašinac…and there is still a presence of the club captain around. Arsene’s assistant is the guy from the famous Back Five. Despite all that, we are on our way to concede more goals than ever in Premier League (1.38 goals conceded per game would finish with 52 goals at the end of the season). I don’t buy the crap that Arsene doesn’t know defending – he has set a knockout stage record in Champions League with a makeshift defence of Eboue, Toure, Senderos and bloody Flamini on LB. Yet, our defending is…inexplicable. Ozyakup We moved on a free for him, that’s a four who can take lay at RB. Firm offer, come home. Secondly Arsenal leading race for Meyer. Ozil, Mustarfi will help. Plus everyone knows we have space. It’s the 4’s and FB cover, plus a new Gk. we need the other winger really. You play them together with cover, then you take it away. I expect Ramsey not to gender rushed. Thanks for the detailed answer. I see what you mean. In a way it is indeed inexplicable. Sometimes I think Arsene Wenger feels the same from his comments after matches. Well, at least we know we have got the best brains in the business being cudgelled to find the answer. Hope he does!